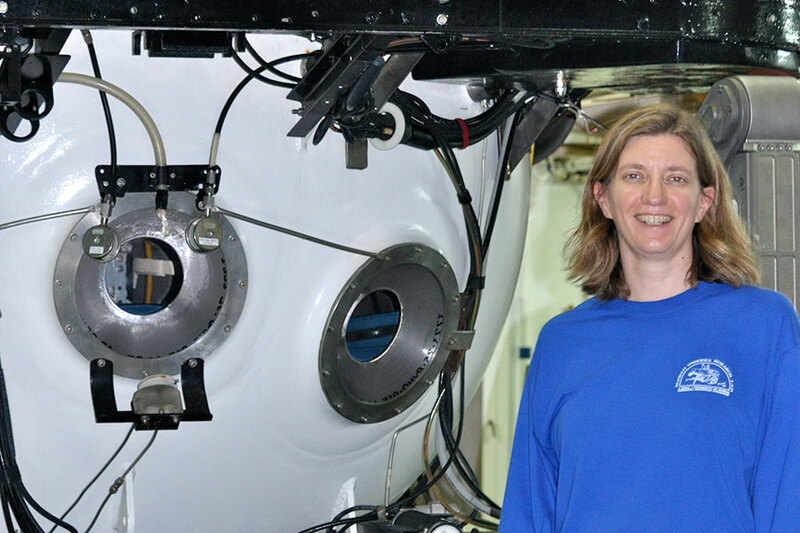 Associate Professor of Earth, Ocean and Atmospheric Science Amy Baco-Taylor next to a submersible in which she has conducted research. Scientists have long believed that the waters of the Central and Northeast Pacific Ocean were inhospitable to deep-sea scleractinian coral, but a Florida State University professor’s discovery of an odd chain of reefs suggests there are mysteries about the development and durability of coral colonies yet to be uncovered. 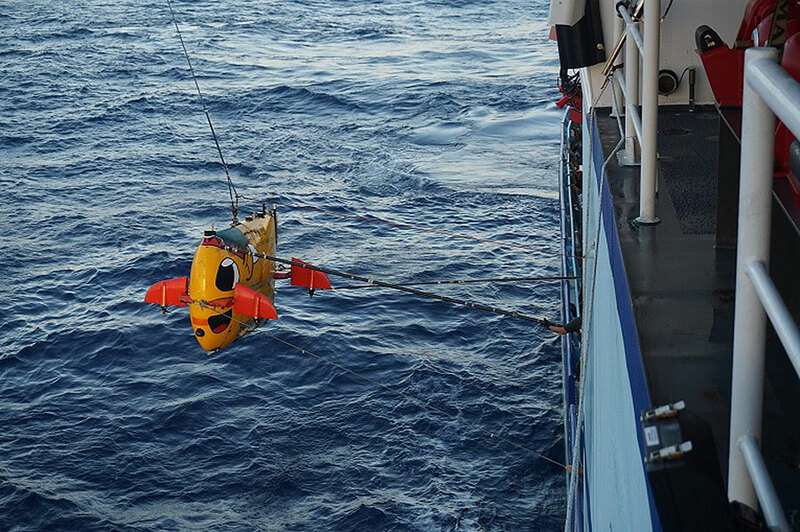 Associate Professor of Earth, Ocean and Atmospheric Science Amy Baco-Taylor, in collaboration with a team from Texas A&M University, observed these reefs during an autonomous underwater vehicle survey through the seamounts of the Northwestern Hawaiian Islands. In an article published today in the journal Scientific Reports, Baco-Taylor and her team document these reefs and discuss possible explanations for their appearance in areas considered impossibly hostile to reef-forming scleractinia, whose communities are formed by small, stony polyps that settle on the seabed and grow bony skeletons to protect their soft bodies. “I’ve been exploring the deep-sea around the Hawaiian Archipelago since 1998, and I’d seen enough to know that the presence of these reefs at these depths was definitely unexpected,” Baco-Taylor said. What are these deep-sea reefs doing in the Pacific Ocean? Scientists are finding out. 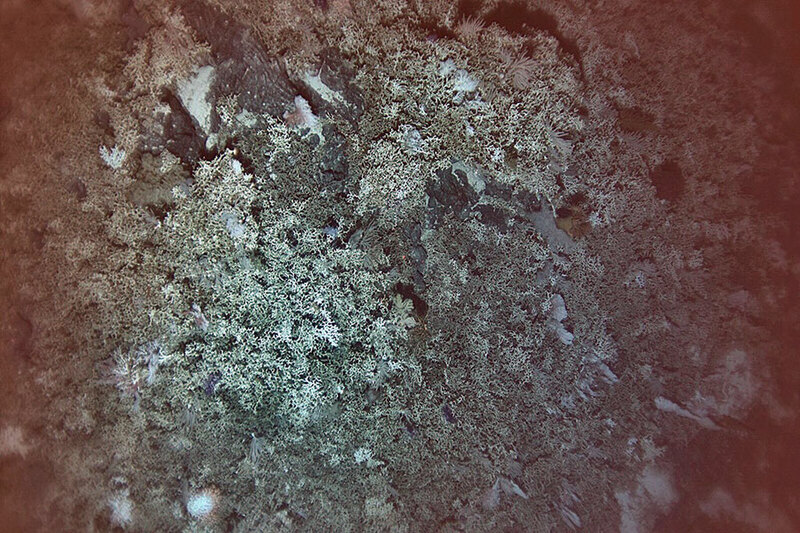 Areas like the North Atlantic and South Pacific are particularly fertile habitats for deep-sea scleractinian reefs, but a combination of factors led scientists to believe that the accumulation of deep-sea coral colonies into healthy reefs was exceedingly unlikely in the deep waters of the North Pacific. Low levels of aragonite, an essential mineral in the formation of scleractinian skeletal structures, in the region make it difficult for the coral polyps to develop their rugged coral skeletons. In addition, North Pacific carbonate dissolution rates, a measure of the pace at which carbonate substances like coral skeletons dissolve, exceed those of the more amenable North Atlantic by a factor of two. In other words, these reefs simply should not exist. In the study, Baco-Taylor and her team articulate two potential reasons for the improbable success of these hardy reefs. Higher concentrations of chlorophyll in the areas of pronounced reef growth suggests that an abundance of food may provide the excess energy needed for calcification in waters with low aragonite saturation. Suitable current velocities in the area may also help the reefs to flourish. But neither of these factors tell the whole story. The unexpected discovery of these reefs has prompted some to reconsider the effects of ocean acidification on vulnerable coral colonies. At a time when stories about the wholesale demise of reefs around the world are sparking alarm, these findings may offer a glimmer of hope. The reefs observed during this research occur primarily outside of the local protected Papahanaumokuakea Marine National Monument, which means they exist in areas where destructive trawling is permitted and active. Nicole Morgan, an FSU doctoral candidate and a coauthor of the article, said that locating these survivalist reefs is crucial because it gives scientists a chance to preserve them. The discovery of these puzzling reefs shows that there are still gaps at the edges of our scientific understanding waiting to be filled. The success of hypothesis-driven exploration, like the kind that produced these findings, demonstrates the importance of continuing to strike out into the unknown. “These results highlight the importance of doing research in unexplored areas, or ‘exploration sciences’ as we like to call it,” said Brendan Roark, associate professor of geography at Texas A&M University and Baco-Taylor’s co-principal investigator. If there are additional reefs sprinkled across the Northwestern Hawaiian seamounts, Baco-Taylor wants to find them. Further study of these reefs could reveal important secrets about how these organisms might endure in the age of climbing carbon dioxide levels and ocean acidification.